File a complaint letter in the event that your information is hacked with this credit freeze request letter. I am writing to place a credit freeze on my account. My current address is ____________________. I have lived at this address for the last ____________________ years. Enclosed is a copy of my driver's license as proof of my identity. 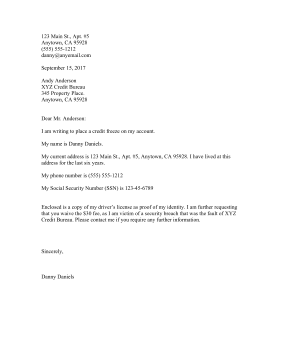 I am further requesting that you waive the $____________________ fee, as I am victim of a security breach that was the fault of XYZ Credit Bureau. Please contact me if you require any further information.